Sundew is an insectivorous (insect eating) perennial plant; the root produces a basal rosette of nearly round, reddish, glandular-hairy, tiny, leaves 1/2 inch across, mostly wider than long, which exude a liquid (dewdrops) that traps insects. The leaves fold over the captured insect and digest it. Naked flower stalks, from 2-12 inches high, are topped by one-sided racemes of small, white or pinkish (sometimes red) flowers which bloom from June to August. Blossoms open one at a time. Grows in wet, acid, and moist places in North America, Europe, and Asia. In the United States, sundew is found in the eastern states, in the Rockies, and in the Sierra Nevada range. Also, Newfoundland to Florida; Illinois, Minnesota. Proteolytic enzymes, naphthoquinone derivatives, plumbagin and hydroplumbagin, flavonoids, organic acids and traces of essential oil. Sundew is a carnivorous plant with ninety species of the Drosera genus throughout the world. Digestive juices, analogous to pepsin, are excreted, and the insect is dissolved and absorbed. Sundew is the smallest of the insect eating plants, it is about the size of a silver dollar. The Venus fly trap is of this family; its leaves are two-hinged blades, with sensitive hairs, that close when touched, thus entrapping the insect. Effective remedy for respiratory ailments and chest problems, including coughs, asthma, whooping cough, catarrh, arteriosclerosis, and bronchitis. It is taken to help counteract nausea and upset stomach. The plant contains an antibiotic substance that, in pure form, is effective against Streptococcus, Staphylococcus, and Pneumococcus. In European folk medicine, the fresh juice is used for warts and corns, and is taken internally as an aphrodisiac. Also, used to help curdle milk. Homeopathically: Epilepsy, hemorrhage, headache, laryngitis, nausea, measles, sciatica. Folk medicine: used for diphtheria, plague, and nerve maladjustments and a “cure for old age”. Tincture: a dose is 3-6 drops. Fresh juice: use a drop at a time on warts or corns. 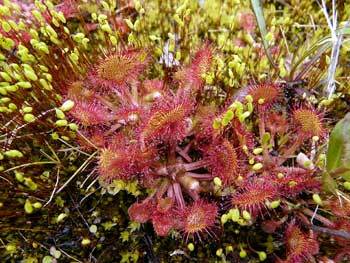 Sundew contains irritant substances and should be used in small quantities only. External applications may cause blisters on the skin. Use under medical supervision.